Red Bull team boss Mark Dutton has his eyes on yesterday's winner Mark Winterbottom as the V8 Supercars teams prepare for this afternoon's 200km race at the UBET Perth SuperSprint. With Prodrive Pepsi Max Falcons earning both wins, and all three ARMOR ALL Pole Positions in the west this weekend, the team is clearly on-form at Barbagallo Raceway and will be a threat to the Red Bull Commodores this afternoon. While Jamie Whincup made it on the podium in yesterday's second race, he said he was almost embarrassed to be there as his Commodore lacked pace. Dutton said Whincup's driving ability played a big part holding position from a monstering Fabian Coulthard, and said the team had to improve its car balance to impact on this afternoon's 200km race. 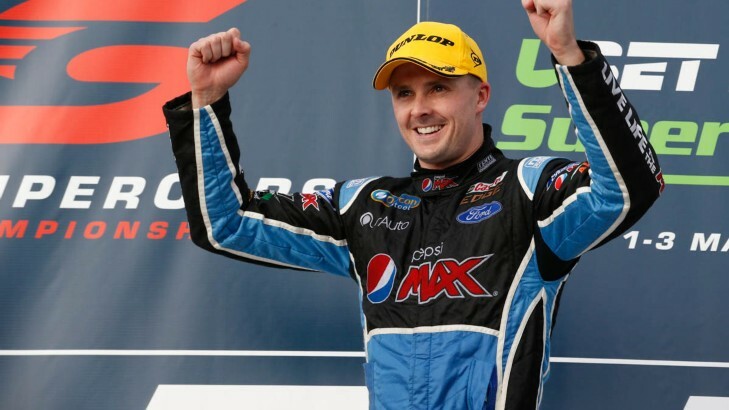 Winterbottom snatched the Championship lead from Whincup by one point yesterday, though both feel it's too early in the season for it to mean much. Winterbottom starts from second, with teammate Chaz Mostert on ARMOR ALL Pole Position; Whincup qualified fourth for this afternoon's race, and teammate Craig Lowndes sixth. "PRA proved they had a quick car yesterday, a very quick car, especially in the second race Winterbottom was very strong. He pulled a gap quickly and looked like he just cruised, so he's the man to beat for sure," Duttontold v8supercars.com.au prior to qualifying. "Then there's also the mix, you've got to keep a bit of an eye on some of the ones who didn't go too well yesterday -because there's such high deg [tyre degradation] here, they've saved tyres. "So there's quite a few up and down pit lane who have saved two tyres or four tyres, albeit hard tyres, but that'll be an interesting one. There could be some dark horses come out and knocking everyone off - as long as they have the car speed." Strategy has been a big focus as teams look at the best options to manage tyres, with plenty of other issues like Safety Cars, that could affect the outcome. "Perth's really tricky," Dutton said. "You can come up with a million strategies but if you don't have car speed they're not going to work - you're not going to win without car speed. "You can't strategise yourself to a win these days because everyone's so competitive; the rest of the field isn't going to fall over. You can't have a slow car and put on the right tyres at the right time and win, you need a quick car and then to do the right strategy." Eyes will be on Darrell Lea STIX driver Shane van Gisbergen, who qualified ninth and saved a set of tyres from yesterday's races for this afternoon. His Commodore is Triple Eight built, and the kiwi will join that squad next season. The 200km race kicks off at the UBET Perth SuperSprint from 2.20pm local time.